The Portland International Auto Show returns to the Oregon Convention Center later this month. "Your ride starts here," is the slogan for the 2019 Portland International Auto Show, but it's more than just a catchy phrase. 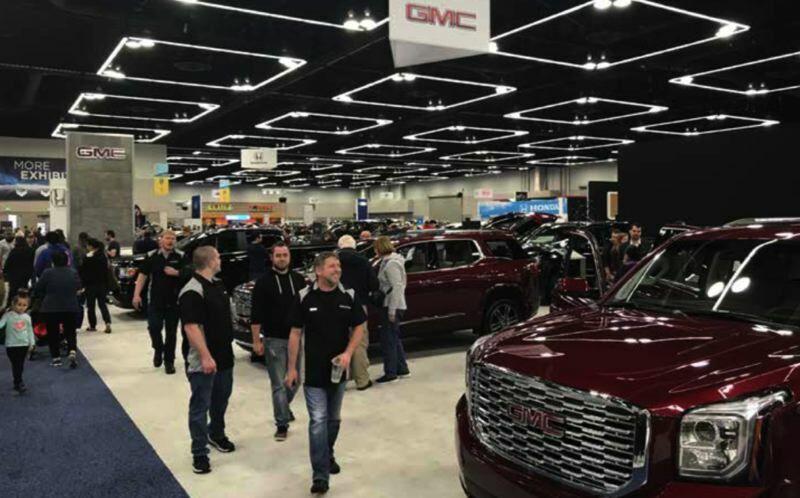 Wherever the journey may take you, the fundamentals you need to know before buying your next car, SUV, or truck are at the Oregon Convention Center from Jan. 24-27. New vehicles of all kinds will be on display throughout the show, from the latest in mid-size and full-size pickup trucks from Ford, Chevrolet, Ram, Jeep, and GMC to the longest list of new SUVs in history. From the subcompact Lexus UX to the futuristic Jaguar I-PACE all-electric crossover, you can choose the SUV that meets your needs and your budget. Every automaker will have their 2019 lineup of new cars, SUVs, and trucks on hand, including the most notable new and revised models. All-new vehicles being presented in Portland for the first time include the Chevrolet Blazer SUV and the 2019 Silverado pickup. Fiat-Chrysler is bringing the 2020 Jeep Gladiator 4X4 pickup as well as the all-new Ram 1500 pickup. Ford will be on hand with the exciting 2019 Ranger mid-size pickup. Passenger car debuts include the 2019 Toyota Prius AWD and the prototype Toyota Supra sports car. American muscle will be well-represented by Ford's Mustang GT, the Dodge Challenger, and the Chevrolet Camaro, all with new features and more power than before. SUVs coming to Portland for the first time include the class-leading 2019 Toyota RAV4 compact crossover, plus the 2019 Honda Passport, 2019 Subaru Crosstrek Hybrid, the all-electric Jaguar I-PACE, and the Lincoln Nautilus Black Label edition. Today's cars are technology showcases, and the Tech Center will show you what's available. From 4G/LTE data receivers for infotainment access to in-home EV charging stations, it's all in one place. Representatives from Audi, BMW, Chevrolet, Ford, Volkswagen, and other brands will be available to acquaint you with their safety, connectivity, and electric vehicle offerings. Also, the Oregon Electric Vehicle Association will have all the latest EVs gathered together for side-by-side comparison in the EV Showcase. Buying a new car is just the beginning, and the independent businesses staffing The Garage will show you how you can customize your car without affecting the basic warranty. Color wraps, performance enhancement, and visual customization are all on the table here, as well as a lounge where you can take a moment and relax. Portlanders love getting out of town to enjoy the natural beauty of the Pacific Northwest, and the Great Outdoors exhibit showcases the accessories needed to make the most of outdoor life. The Great Outdoors is located in the Ginkoberry Concourse near the main show floor. Exhibitors this year include ReRack, U.S. Outdoor Store, and Aero Teardrops trailers. Raffles and discounts are available, so be sure to stop by. The Motorcycle Pavilion is located on the main floor across from the Dragon Café, and features everything on two wheels, or three and even four wheels. Tricycles and quads are also included, as well as exciting new side-by-side off-highway vehicles. Among the brands on display in the Motorcycle Pavilion are Harley Davidson, Royal Enfield, CF MOTO, Aprilia, Moto Guzzi, Indian, Ducati, BMW, Kawasaki, Honda, Triumph, Vespa, and Suzuki. Sunday, Jan. 27th is Family Day at the Portland International Auto Show. On this day only, all kids 12 years and under are free with the purchase of at least one adult ticket. Throughout the show, the Kid Zone featured complimentary activities like face painting, temporary tattoos, balloon artists, and a huge inflatable slide. Snacks are provided for kids at the zone. More than 45 different vehicles from 10 different manufacturers are available for test drives on all four days of the show. Participating brands include Volkswagen, Toyota, Subaru, Ram, Chrysler, Fiat, Jeep, Dodge, Hyundai, and Ford. Test-drive options include SUVs, passenger cars, pickup trucks, and electric vehicles. Look for test-drive options just inside the main doors and on the street outside the show. The 2019 Portland International Auto Show is produced by the Portland Metro New Car Dealers Association. The Pamplin Media Group is the media partner.